The title of this plan appears along the top, with a scale bar and compass star at bottom left. 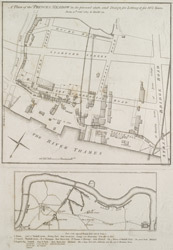 A small inset plan of Southwark, showing the tract of an old Roman road, and key in panel appear below the plan. The plan was produced when the land was leased for building in 1815.